I have a Ripple Blanket (Afghan) that has been going on for more than five years. It's so large now that it's no longer portable. I can't just pop it into my bag and pull it out if I have a couple of minutes spare during the day. It's a heavy blanket too, so it's not the kind of item that I want draped over me in the summer. So I'm confined to the winter months of crocheting this blanket. But there are so many other items which are just so lovely, that I haven't got round to working on this blanket for the last 18 months. BUT it will get finished one day (one winter day)! I love crochet, and I adore creating and generating new ideas and manipulating other people's offerings to this wonderfully creative enterprise. However, the thing that slows me down the most, and where I get a little confused and muddled is over colour choices. I tend to stick to conservative colour combinations. I won't really push the boat out with outrageously clashing colours that just somehow work. I have found that browsing through others people's ideas in this respect helps a lot. I run a couple of classes a week and have found that those that attend the various groups have some fantastic ideas for colour combinations. I often photograph these items and and keep them as my resource for colour choices in other projects. There are a number of websites that I have found immensely helpful when I am stuck for ideas and where the colour creative has deserted me. 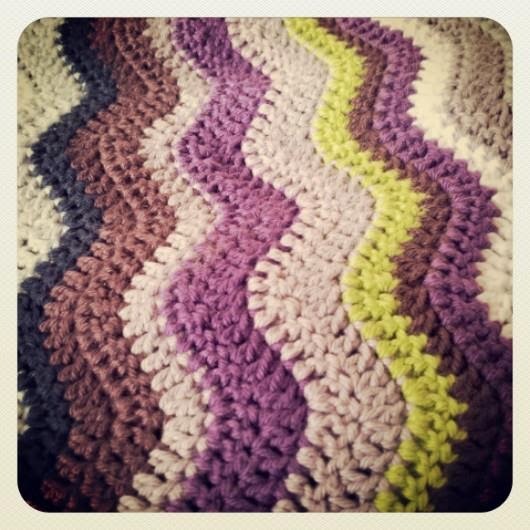 Fresh Stitches have some wonderful posts on colour and colour theory. Have a look at this post on Yarns that Go Together and this one about online tools. Fresh Stitches point to various sites around the web that help with Changing Colours with Stripes and Granny Square colour combinations. I really enjoy using Design Seeds for inspiration in colours that work well together. Crocheting with a cup of tea and a slice of cake ..